by sherylbooks in For Educators, For Parents, Helping Hands Tags: "Children Change the World Conference 2014", "Literature to Inspire"
Last weekend I attended a wonderful early ed. montessori conference, Children Change the World in Calgary, Alberta. Inspiring presenters, dedicated teacher attendees, and superb organization all contributed. Here is the reading list for my Literature to Inspire Program. It’s weighted to younger readers, but many of the titles are suitable for older children too, so read, share, enjoy, and continue to add wonderful books that you discover to this reading list. #kidlitcares: the hashtag behind the initiative: dozens of people and organizations are auctioning off publishing and author-related items and services to support Sandy victims. The Kidlitcares auction is the brainchild of US kids’ author Kate Messner. The second round of the auction will be hosted on Toronto author Joanne Levy’s website http://joannelevy.com/2012/11/02/kidlit-cares/ beginning NOVEMBER 12. Auction items include critiques from top int’l editors and agents, signed copies of books by popular authors, and school visits from famous and not so famous children’s authors. For example, author Helaine Becker will be donating a school Skype visit and author/editor Bev Rosenbaum is offering a manuscript critique, so please bid generously through Joanne’s website. If you are in Victoria this weekend and you love dragon boat racing, come cheer us on at the Gorge Super Sprints. We are the VCKC United Dragon Boat Team. It’s a fundraiser for the MS Society, so don’t forget your wallets! Do you live in or near Victoria? Do you love books? If you answered yes then hurry on over to the TC book sale. There will be something for every taste, and the proceeds go to support literacy in our community. The sale is both today and tomorrow at the Victoria Curling Club on Quadra Street near Caledonia. If you believe in and want to support art education and you have some wall space in need of the perfect piece, look no further than the Blue Horse Charity Auction where original works by Eric Carle, Mo Willems, David Small, Leo and Diane Dillon and numerous other talented picture book artists works are up for bid. 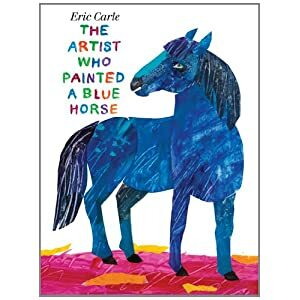 The pieces are a tip of the hat to Carle’s new book, The Artist Who Painted A Blue Horse where Carle pays tribute to the painter Franz Marc. The book and the auction pieces are a celebration of artistic inspiration and mentorship. The profits will fund arts education in public schools in the US through grant programs run by the NEA Foundation. Bidding is under way so don’t wait too long. Sigmund Brouwer is the best-selling author of many books for children and adults. As a tireless presenter with his Rock and Roll Literacy Show across North America, Sigmund knows first-hand what it takes to reach a reader. Denise R. Lyons is Director of Library Development for the South Carolina State Library. Andrew Wooldridge is Publisher at Orca Book Publishers and editor of the Orca Soundings series of teen novels for reluctant readers. Moderator: Rocco Staino is the retired director of the Mary I. Keefe Library at the North Salem School District, North Salem, NY and is a past president of the New York Library Association. He is currently the chair of the Empire State Center for the Book and a contributing editor for School Library Journal. ***If you are not able to make the live webcast of Reaching More Readers—The Book and Beyond, register now and you will get an email notification from School Library Journal after the event when the webcast is archived and available for viewing at your convenience. 1) Write…just do it. Stop talking about it and get a first draft written, one page at a time. 3) Join a writer’s group, either on-line or local. If you can’t find one, start one. 5) Work on your craft, this is a never-ending process… there’s always always more to learn. 6) Once you have a completed first draft, edit. 7)Then edit some more. Edit as many times as it takes to create a polished manuscript. 10) Send your manuscript out to the most appropriate places. Do not, I repeat, do not send your manuscript everywhere. If you do, you will be wasting everyone’s time (including your own). 11) Ignore your mailbox (or email inbox) and repeat steps 1-10.